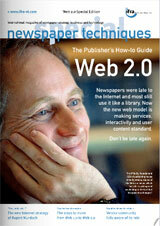 Ifra, the international publishers association, has published a handy beginners guide to web 2.0 for publishers, available for easy online reading or printable. Though I haven’t read through all 26 pages, it seems like they’ve got most of the basics covered. Among other things, it contains an interview with Tim O’Reilly, case studies of Fox Interactive and Faneuil and a lot of easy how tos and what’s whats. I recently talked about what we’re doing with Läsarbladet and citizen media at Aftonbladet to a group of Ifra members. It seems they’ve got a lot of good initatives going. However, I think the above mentioned guide could come in just as handy for anyone who wants to publish themselves online in a sort of journalistic manner. Michael Stelzner has listed the top 10 blogs for writers. A neat resource for any writer, journalist or blogger. The tip comes from Fredrik Wackå, who writes ”the selection is as usual unscientific, but any tips are greatly appreciated”.